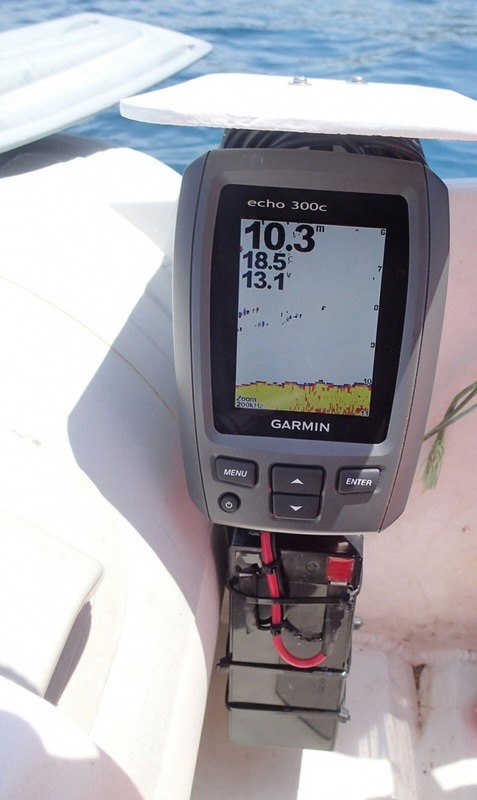 I am looking for "the ideal fishfinder for our 12' AB dinghy with 25hp outboard. Primary purpose would be to identify good areas for scuba diving. Finding structure from the surface is very useful. Knowing the actual depth is too. I don't know enough about the various scan modes to form an opinion yet. GPS is useful to find a known spot or get back to one we liked. And, to get us back to the sailboat or to another bay. It would be nice if the vendor provided an integrated 12v battery. Are you looking for something portable or for something more complicated? I'm considering a whole system for my RIB. I consider the RIB my scout boat, for daily adventures and for active advance recon before bringing in the mother ship. I would like to have a completely contained system, perhaps in a Pelican case, powered by the RIB's outboard battery (and an adjunct supply) so I can check things out effectively. Idealy, and with the advance of current technology, it would have forward scanning and side scan sonar capability. It would have AIS, GPS and a MFD, with the ability to log data for later download onto a database for future inclusion into shared data streaming. These are all fantasies, at the moment, but who knows what awaits us in the near term? I'm sure Nigel Calder and Steve "Nomadness" Roberts would approve. I just finished installing a echoMAP 44dv in my Caribe 12' RIB. The goal was to use the dinghy to scout ahead as needed for anchor spots and paths. Plus fishing with the fish finder/chart combo. I also installed a small Pelican case to mount switches for lights and junction box for power wires..etc while adding new electric start outboard and battery in bow locker. Tried it out last weekend. I think it all was a great addition/install. If you are looking for diving spots I would highly consider a depthfinder that has structure scan. How deep are you looking to find structure? I had a Raymarine Dragonfly on my last boat as a backup plotter / depthfinder. Not really all that expensive and worked really well, I was impressed. One thing though it won't show real picture like bottoms unless water is glass smooth, boat moving up and down will distort the bottom picture. I have no idea how much current it draws though, but you get an excellent bottom machine and a good plotter too. I have a Garmin 100 echo on a little boat I use for cave diving, been a good little machine. Second that! Humminbird or Lowrance have both models with structure scan / down imaging capabilities. Thanks for all the replies. The hummingbird is attractive but I don't think it has structure scan. I also found a couple of reviews that talked about it wobbling while underway. I agree that side scan is important for diving. I confess that I don't know much about it yet. But, we do want to have something that finds structure. re: depth - Generally not deeper than 135 when diving from our boat or dinghy. It was interesting to get 2 replies from people that use the dinghy the same way we do. Scouting routes for the mother ship, exploring, diving, supplies. I liked the Garmin 44 suggestion. Our AB 12' is driven from the outboard tiller. Makes for a wide open interior. We'll have to find a pelican box for the battery and depth finder and deal with making it "portable" We did this 15 years ago when west marine had a depth finder in their "blow out bin for 25 dollars. Same thing, different name ie down imaging.. I made a simple bracket with a Garmin 300c, transducer and a 12v sealed battery. It just drops over the transom. We had the exact same boat! Hummingbird had a battery powered unit with a suction cup transducer that worked great. An inexpensive but very effective and and full-featured alternative is a Vexilar T-box that ties into your Navionics app on your mobile device (iPad, tabet, smart phone, etc). It gives you a real-time sonar feed right on the same screen as your chart (and you can customize the screen appearance if you want to see all chart or all sonar feed). The Vexilar T-box is a communicator that sends the data from the transducer (which is wired to the T-box) to the Navionics app (it does this part wirelessly). Using SonarChart Live feature it even update the map real-time so that you can make charts in your area even more detailed. All this is under $200. I use is on my sail boat, diving boat and jet ski. Love it! Looking at getting an SP300 from Vexilar, to take part in the SonarChart updating on Navionics. I am in Hong Kong, and the Marine Dept - in all their wisdom - has for about a year now shut down for all third party charts, both electronic as well as paper! So f... them, we can do it ourselves. Since I am sailing various smaller vessels, I am looking for a portable solution, more or less ready to go. Anything better than the SP200? I can't see a maximum speed for the (suction cup mounted) SP300. I thought I saw 15 mph somewhere, now I can't find it again. With the SP300, the skimmer style transducer utilizes a suction cup mount for easy installation and can be used safely at speeds of 15 miles per hour. This portable system will also provide boaters with a carrying case to hold the batter and transducer cable. A safety cord is also supplied. I installed my Airmar P66 Triducer (50/200 kHz transducer) depth sounder this afternoon, and will be mounting my Simrad NSS 7 multifunction display tomorrow on my RIB, to act as a scouting vessel for mapping and exploring anchorages and developing local knowledge. I am anxiously awaiting the arrival of my 3D Structure Scan Sonar to augment the ensemble. I intend to use the data acquired by my surveys to create local detailed charts for dredging operations for my yacht club. But, the long term is to use the info to create high resolution local charts wherever I explore, and to upload them to the cloud.